President Donald Trump delivers remarks on the deployment of 5G technology in the United States Friday during an event in the Roosevelt Room of the White House in Washington. 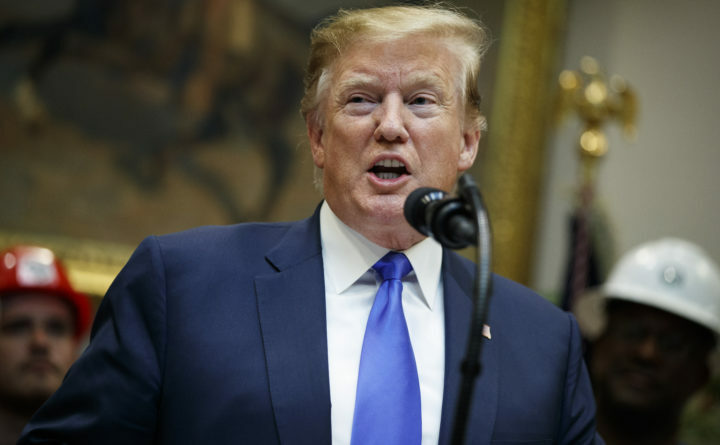 President Donald Trump, renewing his attack on the Federal Reserve, claimed Sunday the stock market would be “5000 to 10,000” points higher had it not been for the actions of the U.S. central bank. The president delivered his latest assault on the Fed as his motorcade pulled into Trump National Golf Club in Sterling, Virginia, for a Sunday outing. His venting comes as his two recent picks for the Fed, businessman Herman Cain and conservative economist Stephen Moore, have come under fire, with several Republicans indicating Cain may not be able to win confirmation in the Senate. It also comes days after Federal Reserve Chairman Jerome Powell, a frequent target of Trump’s criticism, told lawmakers at a Democratic Party retreat that the central bank won’t bend to political pressure, according to two people in the room for the closed-door event. Trump picked Powell as Fed chairman, replacing Janet Yellen, but later indicated that he regretted the decision, and in late 2018 discussed the feasibility of firing him before appearing to decide against it. Trump has criticized the Fed’s rate increases as it tried to gradually move them to a level that neither stymies nor stimulates growth. The rate hikes have slowed some segments of the economy, such as housing, but overall the U.S. economic expansion continues, along with the lowest unemployment in decades and inflation near the Fed’s 2 percent target. Lately, Trump has urged the Fed to cut rates to turn the economy into a “rocket ship,” which White House economic adviser Larry Kudlow said last week would be growth in the 4 percent to 4.5 percent range. The Federal Reserve raised rates four times in 2018, but has since paused, saying it will be “patient” as it assesses the need for any additional changes in the policy rate, now in a target range of 2.25 percent to 2.5 percent. U.S. stocks have risen sharply this year after the Fed’s dovish pivot, reversing a late-2018 swoon. The benchmark S&P 500 Index closed Friday at 2,907.41, less than 1 percent below its record high close from September. U.S. central bankers in March signaled no rate moves in 2019, based on their outlook for solid if unspectacular economic growth with inflation near goal. If Trump was referring to the more narrow Dow Jones Industrial Average, his tweet suggested the index could be over 36,000 points absent the Fed’s moves. The Dow closed on Friday at 26,412.30. While many politicians want their central banks to juice growth by keeping monetary policy easy, the risk is the political meddling leaves investors worrying about a flareup of inflation and push up market interest rates in response, potentially hurting expansions.